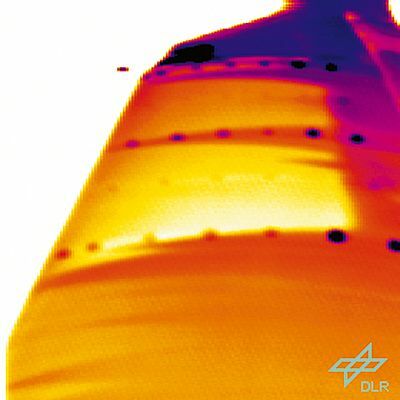 DLR Dornier 228 test airplane with an infrared camera on a tripod in a special housing visualizes a part of the upper side of the right wing. IR image of the upper side of the DO 228 wing during the test flight: the laminar-turbulent transition is clearly visible. Laminar and turbulent flow and their transition on an airfoil. Diagram showing experimental setup for flow visualization in a wind tunnel with infrared thermography. IR image of a helicopter airfoil in a wind tunnel test with a laminar separation bubble, small vortices and flow separation at a high angle of attack. The Deutsches Zentrum fur Luft- und Raumfahrt (DLR) is Germany's national research center for aeronautics and space. The organization focuses on both fundamental and applied aerospace research and development. Its strategic objective is to enhance the competitiveness of Germany and Europe's aerospace and air transport industries. DLR has also set itself the challenge of making the fast-growing air transport sector efficient, environmentally friendly and sustainable. DLR employs around 5,100 people in 31 establishments and maintains offices in Brussels, Paris and Washington DC. Some 700 researchers and scientists work at the research center annex airstrip in Braunschweig (northern Germany). The site is home to the Institute of Aerodynamics and Flow Technology. One of the goals of aerodynamic research is to give the airfoil (wing profile) of an aircraft the required form and properties which minimize drag of the wing. The main task of a wing is to produce a lift force that is in opposition to, and equals the airplane's weight force. Aerodynamic engineers and scientists design and develop wing airfoils which are able to produce a maximum lifting force at a minimum loss. A long-time research project at the Braunschweig-based Institute of Aerodynamics and Flow Technology focuses on so-called boundary layer flow around an aircraft. This thin layer transmits friction forces from the aircraft surface to the air around the aircraft. The boundary layer can be 'laminar', which means that it deals with small friction forces resulting in small losses of propulsion energy. Or it can be 'turbulent', which means that it is subject to much larger friction forces, requiring a significantly larger energy consumption to keep the plane going. Compare it to water flowing from a tap at home: at first it will come out in a laminar flow, when you turn it on more (at a higher flow speed) the water flow will be turbulent. Special 'laminar' airfoils are currently widely used for wings of gliders. Commercial aircrafts, however, could also be designed to use the 'laminar' technology: the laminar wing is said to reduce fuel consumption by 15%. An impressive figure nowadays. And the reason why DLR is investing resources in relevant research projects. Laminar flow, turbulent flow and in particular the point of transition on the wing needs to be observed and visualized. This is mainly done in wind tunnels, where realistic flight speed of commercial aircrafts can be simulated. 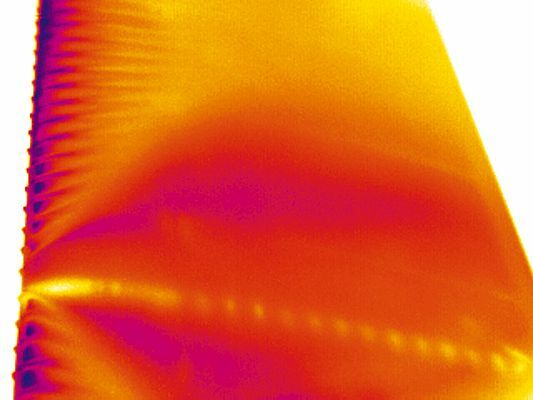 Infrared thermography is an important research method: the temperature differences between the wing model and the surrounding flow, which are mandatory to discern developments, are present. Due to the different heat transfer in the laminar and turbulent flow areas, there is a different cooling or heating pattern in these areas which can be visualized with an infrared camera. So the surface in the laminar boundary layer shows a different temperature than in the turbulent boundary layer. 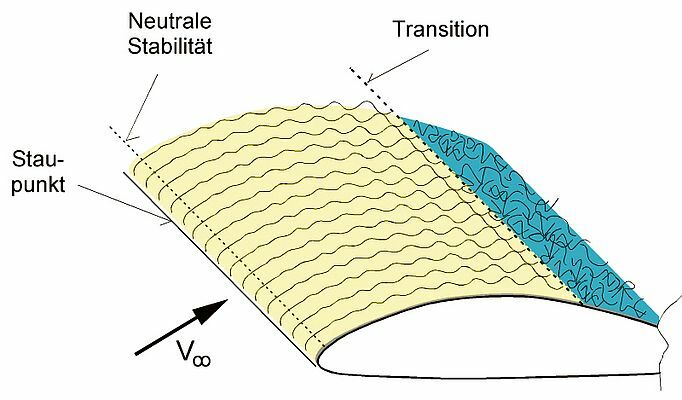 "If the wind tunnel model is manufactured from metal, we provide a thermal insulation of the surfaces", says Dr. Klaus de Groot of the Braunschweig-based Institute of Aerodynamics and Flow Technology: "otherwise, the large heat conduction inside the model would destroy small temperature differences. And, of course, we avoid the typical reflection which appears when metallic objects are scanned with infrared. We do this by putting a coat of lacquer or a thin plastic layer." The institute's NTLF (New Transonic Laminar Wing) project used thermography during test flights. To allow a best possible view on the wing, a Thermovision AGEMA 880, a predecessor model to the current FLIR Systems ThermoVision A 40, in a special housing has been put on a tripod and fixed on the body of DLR's Dornier DO228 research airplane while a second infrared camera was placed in the plane's wheel well underneath. The purpose of the project, which was sponsored by European Union funding, was, among others, to test a wing with a natural laminar airfoil equipped with an anti-icing and cleaning system, as is often done in commercial air traffic. This combination showed that a long extent of laminar flow can be achieved on wings of commuter aircrafts. Further testing at even higher speeds has proven that the extent of laminar flow can be prolonged by sucking/ exhausting a part of the boundary layer through a porous surface: 50 micrometer small holes drilled by a laser on the wing's front part siphon off part of the flow, and enhance the extent of the laminar flow. These findings would have been hardly gathered without thermography. "Thermography provides two-dimensional information about the entire boundary layer. And it shows us what is going on in the entire wing area on a non-contact, non destruction testing basis" says Dr. Klaus de Groot. "Moreover", he adds, "the technological development towards Focal Plane Array cameras with Quantum Well Infrared Photodetector (QWIP) sensors has been of decisive importance for the success of our institute's research projects: the ThermaCAM SC 3000 camera grasps temperature differences as small as 0.5 K."
Thermography is an excellent method to visualize the boundary layer state around the airplane wing under extreme conditions such as in wind tunnels as well as during flight tests. 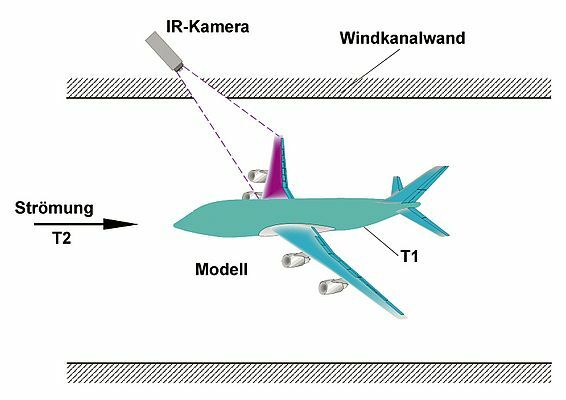 Consequently, infrared thermography contributes to new findings in aerodynamic research which in turn lead to substantial energy-saving improvements in aircraft aerodynamics.